As a general rule of thumb it is said that it is better to give than to receive; this ethos presumably supports the notion that we all follow the principal of treating others as you would wish to be treated ourselves. “Givers” are not only generous people by nature not limited to particularly in financial terms, but they ‘give’ endless, of themselves, or their time. We can all most probably think of the “Givers” that we know and have met through our lives. We remember “Givers” with a warm heart as their kindest stays with us long after they have left. We all like to think of ourselves as “Givers”. Every women I interviewed who was searching for her ‘soulmate’ wanted to meet a “Giver”. On the other hand “Takers” are basically only interested in themselves, they only contact you when they want something and will rarely, if ever ask how ‘you’ are. They are by nature intrinsically insincere and will often display a very different persona in private to the one they show in public. “Takers” like to talk about themselves and have this somewhat unique and rather irritating technique of being able to turn any conversation, on any subject matter back to them and their needs. Utterly ruthless, in both persistence and pursuance “Takers” chew away at the bone like a rabid dog until they get what they want. The old adage of if you cannot say something nice then better not to say anything at all does not appear in the “Takers” mind-set. They speak negatively about people who don’t or won’t do what they want or who challenge them in any way. As hard as it may be to believe “Takers” are more often than not insure. They will endeavour to disguise their insecurities by being full of their own self importance, name dropping whenever possible to raise their perceived level of importance; because they like to talk about themselves they will brag about whose company they have been in, who they know and what they have done. The bragging does not stop there as “Takers” truly do believe in their own propaganda, if they say that they are an expert, they believe it! It is rare for a “Taker” to wait for a compliment or acknowledgement of their skills because before you can comment they will have told you just how wonderful they are! On the flip side they will compliment others; however such compliments are often regarded as ‘over the top’. “Takers” love a touch of ‘false flattery’, but beware as compliments deliver this ways will almost certainly be followed by a request for one favour or another. “Takers” are not ‘joiners’ and if they do join social or business groups it is to be seen to do so, they will rarely, if ever actively make any real contribution to blogs or debate. One of the prime reasons for this is that they find it almost impossible to ‘actively listen’. “Takers” find it difficult to physically demonstrate that they are listening to play back their understanding of what has been said; to identify body language and gestures; to have any ability to ‘read between the lines’ and hear what has not be said and this is because “Takers” are so insular and myopic. In my novel “Soulmate” there are “Takers”, both male and female. One character in particular I refer to as “Charm Syndrome Man” or in others words a “Taker”…an ‘emotional manipulator’. These type of people are so hard to spot particularly as they think that they are normal and don’t believe that they are doing anything wrong. What you have to remember about “Takers” is that at the end of the day they are only really seeking your opinion in order to valid and confirm theirs. “Takers” have an inbuilt sense of entitlement in order to get their own way……… no matter what. So if you are dating or working with somebody that talks constantly about themselves, that never really appears to be listening to what you have to say, or that is always reliant on you for some favour or other then beware as you will most certainly be dating or working with a “Taker”. 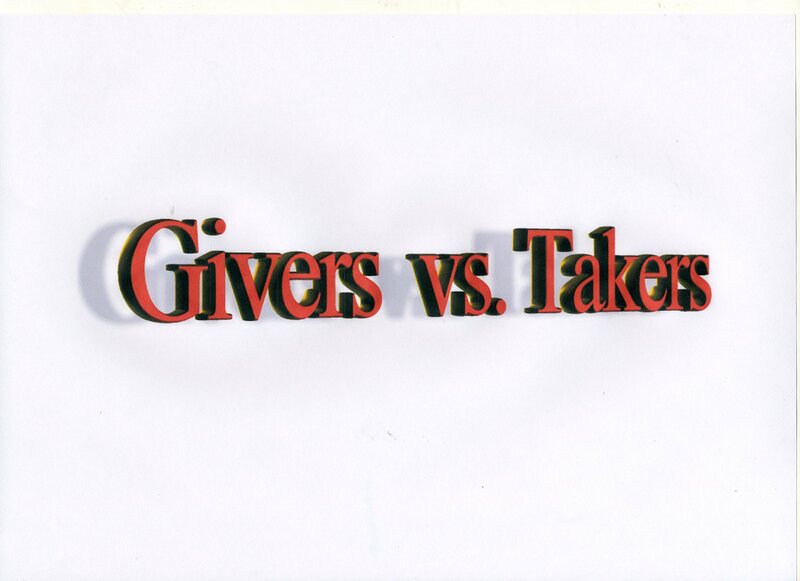 So are you a “Giver” or a “Taker”?